The computer operated, BRASSIOLA provides objective radius measurements and is easily used for lathe set up. of contact lenses and intraocular lenses. Accurate radius measurements on any area on the surface. 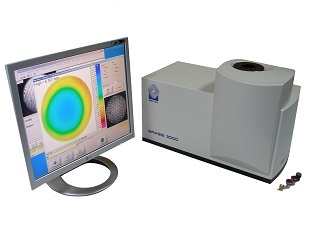 Accurate cylinder, axis and residual toricity measurements. A fringe pattern providing immediate information on the optical characteristics of the entire surface. A quality graph displaying the distribution of radii within any area of the surface. A numerical quality scale indicating the quality of the surface. NEW: Lathe alignment analysis - providing invaluable information during the production process to determine the accuracy, alignment and status of tools during lathing. The BRASSIOLA easily detects small defects, not visible using other equipment. The BRASSIOLA does not require vibration isolation. The BRASSIOLA tests up to the entire surface of the sample, including annular measurements.